When installing the AODocs Smartbar Chrome extension, end-users are asked to grant permissions on their G Suite account. - All the permissions listed below are subject to change in next Smartbar versions depending on requirements for new features, technical changes, new Chrome APIs. When a new version of the Smartbar requires additional permissions, users will be prompted to authorize the new permissions before to activate the new Smartbar version. - It is possible to enable Smartbar features in different Google Services. 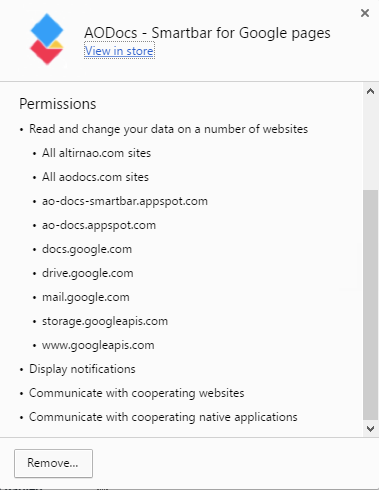 Note: If the AODocs Smartbar has been installed on the G Suite domain by the G Suite super admin, the end-users will still have to accept these permissions individually. The permissions can be reviewed in the Chrome extension menu. The extension can read or change data available in any AODocs page if needed. The extension can send HTTP requests to the AODocs API and AODocs Smartbar project. The extension can add Smartbar features in the Google editor for Google documents. The extension can add Smartbar features in your Google Drive interface. The extension can add Smartbar features in your Google Mail interface. The extension can send HTTP requests to the Google Cloud Storage service to retrieve a global configuration file for the smartbar. It allows AODocs team to fix display bugs without uploading a new version of the extension. The extension can make request to the Google APIs. The Smartbar can use the chrome.notifications API to create and show some rich notifications to the user in the system tray. The AODocs web pages can connect to the extension (send messages to the extension and get answers from it). The extension can communicate with a local application launcher agent (AODocs WebDAV client), which is used to start Microsoft Word/Excel/Powerpoint when opening Microsoft Office files from the Google Drive or AODocs user interface.